...I remember the last time I talked about chillwave, back in 2015 when I reviewed Neon Indian - and that's saying something because I'm getting the impression that whole genre designation is something music critics nowadays want to forget ever happened. And man, I wish I liked it more. Again, like most genre-hopping bands with this pedigree there were a number of things that just did not work for me, and ironically they started with the opposite problem I had with Neon Indian, in that I liked the gummy, lo-fi chillwave touches in the production that felt more like accent texture than drowning the mix. But the further he stepped away from it, the less interesting the music became. Part of this was increasingly easy parallels to better acts, but with Toro y Moi's voice moving more to the forefront, the undercooked writing and odd feeling of petulance really started to wear on my patience, especially as the albums got longer with less momentum. Granted, when I heard this album was going even more synthetic and taking more steps towards funk I was intrigued, but I've had mixed luck with this brand of funk and I wasn't sure the trappings of chillwave are what I needed to make it work, but what the hell: how is Outer Peace? So I've been sitting with this album since it leaked, trying to find an inroad to discuss my feelings on it... and it's funny, while I can describe how much this album feels like another odd turn for Toro y Moi, sliding towards the bouncier, defined dance grooves of Anything In Return amidst some of his cleanest and dare I say most contemporary and accessible production to date... the odd feeling is that I wouldn't say this album moved the needle for me. 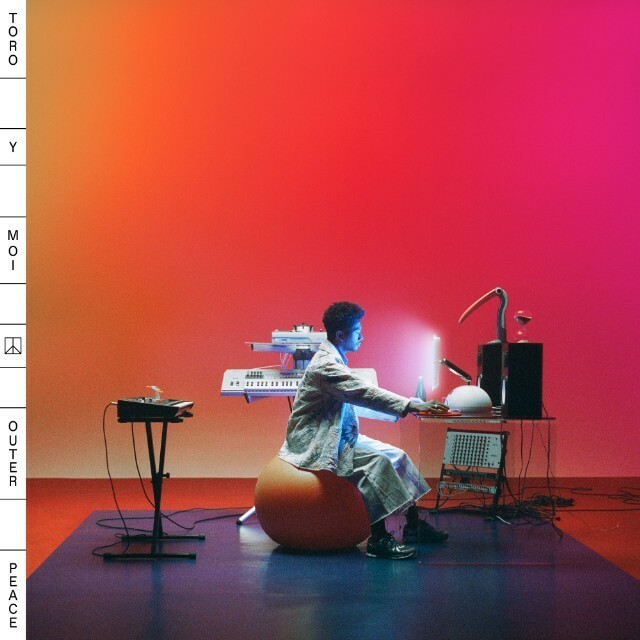 It's certainly not his worst project to date - there's enough thematic coherence and groove to this to keep in quality territory... but at the same time, it slides Toro y Moi towards a more anonymous sound that isn't quite resonating for me, especially in comparison to his first two or three albums that felt more textured. In fact, let's start off with production texture, because more than ever this album seems to have polished away the layers of damp reverb and organic fuzz that gave Toro y Moi so much flavour early on, instead tilting towards a more brittle set of beats, chilly synths, and increasingly clipped autotune wrapping around Chaz Bear's vocals. Even the guitar and bass rollick feels ever so slightly oily against blockier percussion and a mix that might have some well-defined space but doesn't quite bring the same type of cushion or density. And I'll say that when it at least comes with Chaz Bear's delivery, this might have been a misstep, because he already doesn't have a incredibly distinctive vocal timbre and it's not like the autotune or other warping contortions trying to compliment his low-key funk add to his personality all that much - and while there are songs here like 'Who Am I' that might imply he's aware of this, it's not exactly a redeeming factor. And sure, vocals have rarely been the most important thing about any Toro y Moi projects... but when you have that warped falsetto playing off the blubbery house groove of 'Fading' - really, whenever his falsetto shows up - or all the warped, crackling gargles across 'Freelance', it's hard to avoid the feeling those vocals might be getting more emphasis than they should. And look, I'll freely admit that can be exasperating to point out when there are songs that can pick up a more textured and interesting groove: even if I don't really like the synth on the hook, the hand percussion playing off the funk and piano is solid on 'Ordinary Pleasure', and the watery strumming of 'Baby Drive It Down' against the blockier beat might just be the best song on the album. Hell, even if it's a little cleaner than I'd prefer, the stuttered patter of the drums against the rubbery house synth line on 'Laws Of The Universe' has real groove and the dense percussion line against the spacey fragments on 'Who Am I' connects well. But then we have cuts like 'Miss Me' with some sensual vocals from ABRA that fills out its background with minimalist keys and birdsong or the layered vocal fragments surrounding 'Monte Carlo' or the warping pianos and even thicker autotune on '50-50'... but hell, with the borderline trap percussion, you could give this instrumental to Bryson Tiller or Daniel Caesar and most people couldn't tell the difference, and that's not something I would have said about Toro y Moi before! And that skirts around how much songs like 'New House' and 'Monte Carlo' owe a pretty obvious debt to blonde-era Frank Ocean in approach and tone if not exact timbre, and for an artist who has been praised so fervently for blending and elevating his influences, to see him not deliver can be frustrating. And that's not even mentioning the most pronounced influence, especially in the content, and let's get to that blatant shoutout moment: the final verse on 'Laws Of The Universe' that is an explicit response to the critically beloved debut single 'Losing My Edge' by LCD Soundsystem. And this moment really is the key to explaining the theme of this album, because it showcases the impermanence of those parties and how age and time will make it all slip away - which yes, even for the muted haze of Toro y Moi is a thought that lingers. All across the album the most pronounced motifs are fading pleasure, getting older, and an increasingly desperate desire to have something permanent out of all of it - and while James Murphy began his career trying to write himself into music history, there's a little more pathos when it comes from someone like Chaz Bear who has been active longer... although let's get real, it's only been about a decade, and while he's churned out a lot of work, it can feel thinner when you remember he's only in his early thirties! But so many millennials want to be older and wiser than we are, so in a sense I do get why he wants those old symbols of success and permanence in the house and car... even as he realizes their own worth to him can feel lessened if he's always on the road and can't appreciate them. And I like how he highlights that lack of permanence has led for many to a crisis of identity, all the more accentuated by life on the road and social media, and I appreciate the framing of this scene - aware of the potential emptiness of building an identity there, but it's not like what he's using is any less ephemeral. And it also becomes very clear he's seeking this out in the face of not having that relationship connection... and if I think this album stumbles away from a strong conclusion, it's here. Yeah, those relationships can be just as fleeting and he knows it, but that same weird feeling of petulance prevents any of that outer peace he seeks from really materializing, and it makes his stabs in that direction feel inconclusive at best and kind of lightly toxic at worst. So as a whole... look, if you're looking for a Toro y Moi project that might be the most accessible to date, this is easy to recommend, but at this point Chaz Bear has taken the project enough steps from the original sound that I can see some fans really turning on this... kind of a shame because I think there's some good ideas and thematic consistency here that I appreciate. Granted, it's not a project that I find exceptional or ground-breaking - in fact, I'd argue it might be Toro y Moi's safest to date - but it's fine enough. I'm thinking a solid 6/10, recommended for the fans or the curious, but otherwise you can probably move past this - hell, most of the time, you might even think he's expecting it.